Here’s Rico Rodriguez with Gunga Din. It has nothing at all to do with goat cheese or rolls, but I’m completely infatuated with his music at the moment. He’s a ska trombonist (he played the trombone on the Specials Message to you, Rudy) His album Man From Wareika is phenomenal, and I can’t stop playing it (thanks, Tony!). So sweet and soulful. This makes six largish rolls. I wanted to start with a small batch, because I wasn’t sure how they’d turn out. Dissolve the yeast & sugar in the warm milk and leave to get foamy. In a large bowl, cream the butter. Add the egg and the yeast mixture and mix well. 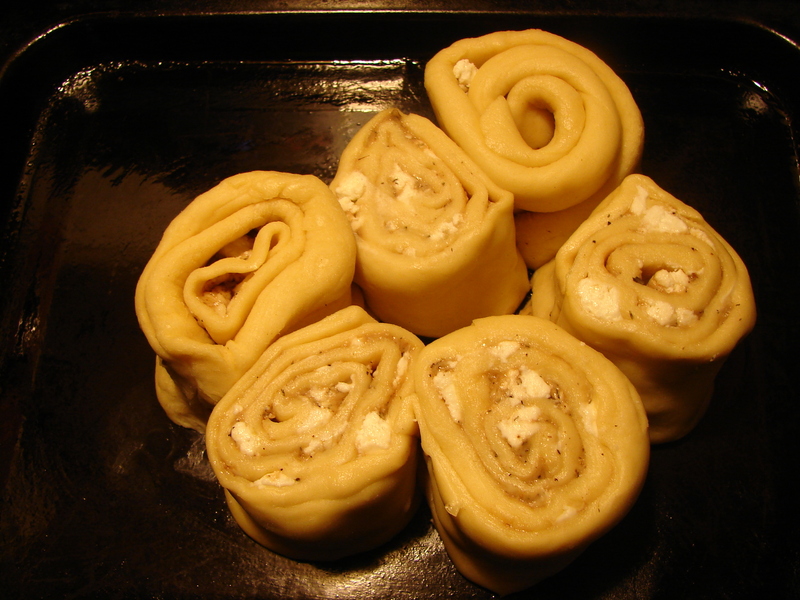 Add the flour, salt and baking soda and mix everything together. Then add the soured milk. At this point you should have a workable dough, but if you need to add more flour or milk, go right ahead. Knead for about 5 minutes, until the butter is completely incorporated, and the dough is soft and elastic. 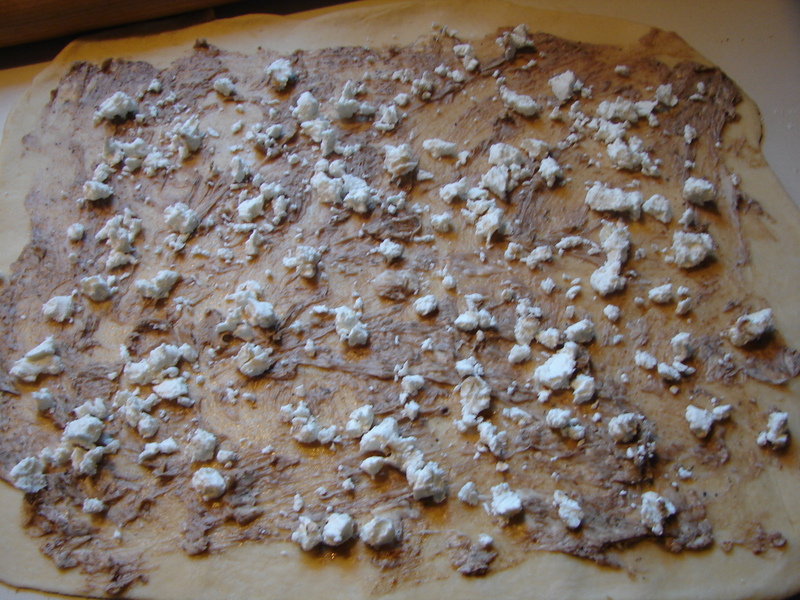 About an hour before you’re ready to eat these…roll the dough out to be a big rectangle. 1/4 inch thin X 1 foot X 16 inches, approximately. Mix the softened butter, the balsamic, the brown sugar and the thyme. It won’t all incorporate perfectly, but don’t worry about it. Spread this over the dough – right up to the edges. Now crumble the goat cheese over. It needn’t all be the same size, but try to get it fairly evenly distributed. Now decide how many and how big you want your rolls, If you roll it up starting at the shorter end, you’ll have fewer bigger ones (right?) and vicey versey. 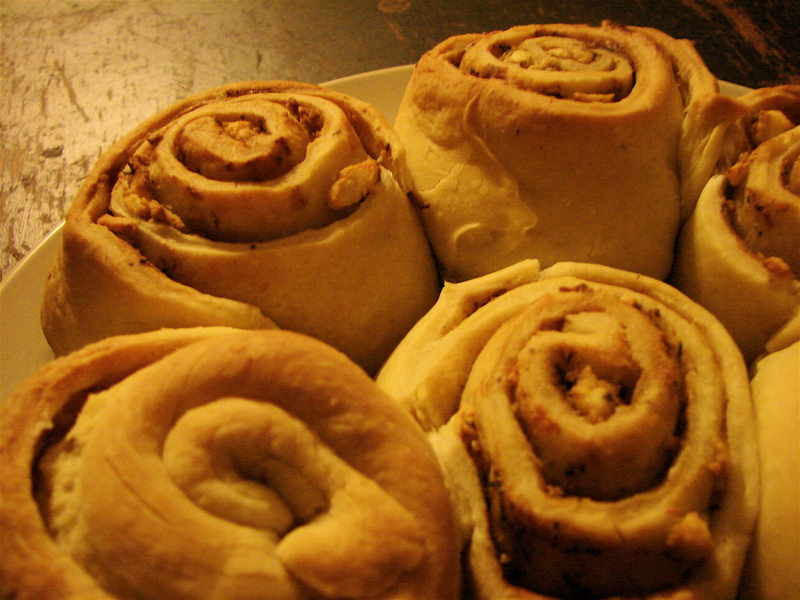 Roll the dough up however you decide. Then cut it into pieces. I cut mine about 2 inches wide each, but you could make them smaller if you wanted to. Set them next to each other on a greased sheet. Let them rest for another 1/2 hour. During the last fifteen minutes of this, preheat the oven to 375. Bake for about half an hour, till they’re big and fluffy and golden brown and crispy. 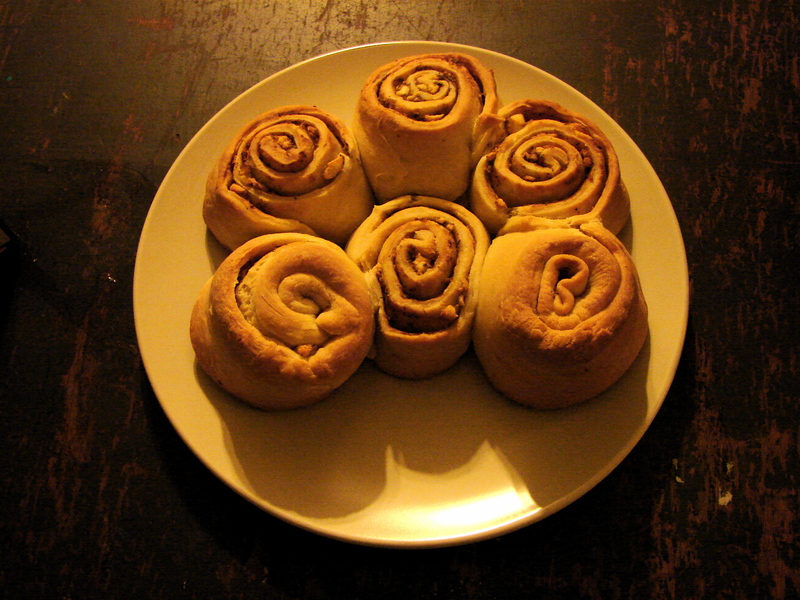 This entry was posted in recipe and tagged buns with soup, goat cheese, goat cheese buns, savory cinnamon buns by Claire. Bookmark the permalink. Just wanted to let you know that I am following your blog and will be trying out some of these recipes! These sound delicious, but I’ll have to hope that someone brings some to a ‘SpilleRRs picnic, ’cause DsMam hates goat’s cheese with a passion.